The other night, we were hanging out in Northern Liberties. R hadn’t eaten dinner before leaving, so we stopped by a random pizza spot so she could get a slice. 2nd Street Pizza was the lucky winner. And they were home of the biggest pizza slice I’d ever seen in my life (sorry for the sucky cellphone photo). 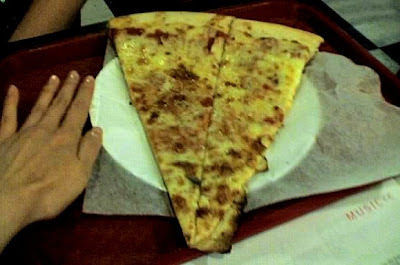 My hand on left, giant pizza slice that had to be sliced in half to be eaten on the right.